Holi, the “Festival of Colors” is a major celebration in the Hindu religion. This year it falls on the 23rd of March. Holi is a great time to play with colors with your kids. The streets of India become flooded with people singing, dancing and throwing colored powders & colored water at each other. We decided to indulge in some pre-Holi fun by splashing colors on paper! 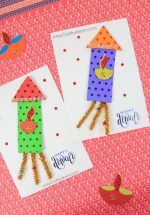 These Colorful Paint Splatter cards for Holi were so much fun to make! 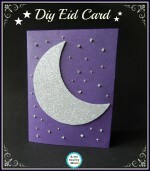 Making your own cards is the perfect excuse for some crafty fun. My daughter was so proud of how nicely our hand painted color splash HOLI cards turned out, and she cannot wait to mail them off to faraway family and friends who can’t be with us to enjoy the festival in person. Start off by printing our Template onto white cardstock. It makes 2 cards approximately 5×7 in size from one A4 sheet. 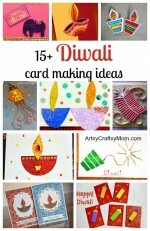 Cut along the gray border and fold to make your blank cards with text – “Happy Holi”. You could alternately just write your own message with a black marker or even use a stamp. Now comes the fun part. Make sure you line your workplace with a plastic sheet or newspapers. It helps to sit in the middle of the room or outdoors so that furniture or walls don’t get splashed by accident. We used liquid glass paints that came in tiny plastic bottles with a nozzle. It was easy to hold and splatter directly with it. Using vibrant watercolors and a paint brush would yield equally stunning results. Start off my randomly splashing a pattern in pink. We used Pink, yellow & red. But you could use any complimentary color set of 3. Miss P was fascinated by the free flowing patterns that emerged when different colors mixed with each other. We used a brush to splatter and so we got smaller dots and smear lines. We used a straw to blow some color splats. The best part about these cards is that each one turned out unique. Aren’t they gorgeous? And so simple to make. Feel free to pin the below image onto Pinterest for your future reference. It’s the perfect size too. This post is part of a month long blog hop to celebrate International Crafts month. 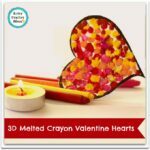 Every day from 1st of March till the 30th bloggers will be sharing crafts from around the world to help you teach your children about crafts of the world. Do join us and visit the other participants. Click the picture below to go to the Events page. Can’t wait to see your creative crafts and try with my lil one. Loved the holi cards too.